As the heart of winter descends on Toronto, there’s debate at city hall about a gap in next year’s funding for 24-hour homeless shelters. The city funded a round-the-clock drop-in program at St. Felix Centre and Margaret’s Toronto East Drop-in Centre from Jan. 1 to Feb. 29, a decision Coun. Joe Cressy said was sparked after three people froze to death on the streets last winter. And while St. Felix staff say their 50 beds are full each night — and that clients drop in throughout the wee hours — there’s no promise to renew the $416,000 funding for the program in the preliminary 2016-2017 budget. “People come for all different reasons, sometimes to socialize, to have meals or to just be inside from the cold,” St. Felix’s Rusan Lateef said Saturday. 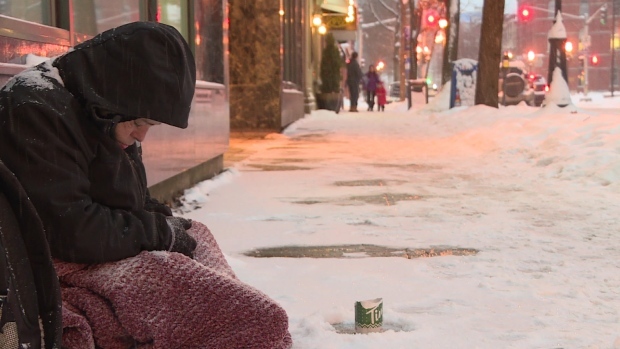 Roughly 5,200 people are homeless in Toronto, according to research published by the Homeless Hub in a 2013 survey. About 450 live on the streets, while the remainder live primarily in shelters. Mayor John Tory did not directly speak to the issue of 24-hour drop-in centres when asked by CBC News about future funding for the winter program. The city’s budget committee has held discussions all week about what the 2016-2017 document will look like. Tory said that many of the projects discussed by that committee are geared toward serving the homeless. But Cressy said that he wants to see a firm commitment included in the budget for the 24-hour centres, saying that they provide a life-saving service. A regular at St. Felix, who identified himself only as Jimmy agrees, saying he often comes in to warm up during the middle of the night. For those unable to secure a bed in one of the city’s shelters, there were other volunteers moving through the city this weekend, handing out winter survival survival kits — a project spearheaded by the group Engage and Change. The organization put together nearly 3,000 of the kits, which include hats, mittens, food and sleeping bags that the project’s founder Jody Steinhauer says are critical to surviving a winter outdoors. “They’re the most important thing and the thing that goes quickest in weather like this,” she said. “These are like gold on the street.